While blackberry plants are perennials, their canes are biennial, producing berries on second-year growth. These second-year canes then die (after fruiting), and new canes are produced either from the roots of the plant or from the base of the old canes. It is important to understand the different types of blackberry plants and the growth cycle so that you can care for the blackberry plant. 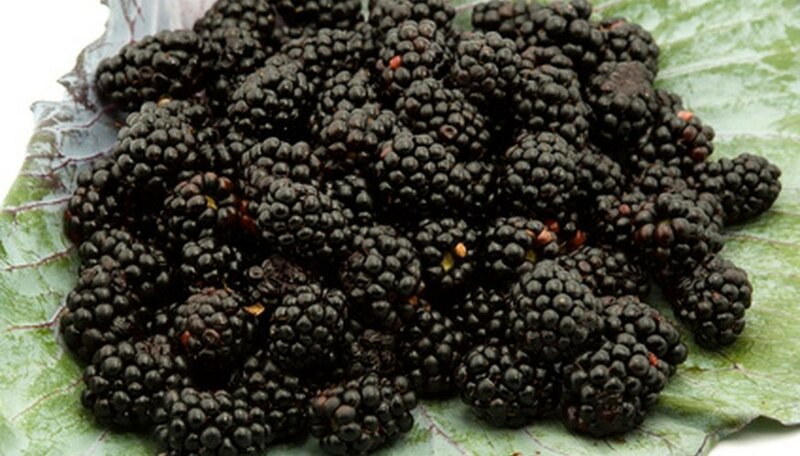 Blackberries can be divided into two types: trailing and erect. The difference between the two types of plants is in the way that they grow. The arching canes of an erect blackberry plant are sturdy/stiff canes that support themselves, while trailing blackberry plants have canes that cannot support themselves. There are many cultivars available, each with its own habitat requirements, fruiting period and fruit size and flavor. Both mature trailing and erect blackberry plants have primocanes (canes that are in their first year of growth) and floricanes (canes that are in their second year of growth). Fruit is produced on second-year cane branches. After the canes produce berries they die. These floricanes are then removed and the primocanes are thinned out and trained as they will be the fruiting canes for the next fruiting season. Select a site that is in full sun for optimum fruiting. The plants are tolerant of partial shade but prefer full sun. Blackberries require well-drained, organically rich, loam soil with a pH of 6.0 to 6.5 This is important because they are extremely sensitive to wet soil. They do not tolerate clay or sandy soil, except for the thornless evergreen cultivar, which tolerates heavy, poorly drained soils, according to the Oregon State University Extension. Blackberries can live from 15 to 20 years so it is important to choose your site carefully, and to build a sound trellis system if you are planting a number of plants. Even though erect blackberry plants can support themselves, a trellis system is neater and makes fertilization, cultivation and picking the berries easier. How elaborate or simple your trellis system is depends upon the number of plants that you are planting. Stakes can be used for just a few plants, or you can train a few plants to grow on a garden fence. When growing a large number of plants your trellis system will be more elaborate, and wires strung between wooden posts will be required. Plants are then trained to grow on the wire structure. During the first year that you plant your blackberry bushes they will require little if any pruning. Once plants are established after a year, you will begin pruning them. Once erect cultivars have reached a height of 3 feet, remove 1 to 2 inches from the top of the new/primocanes. This should be done during the summer. Canes will then begin to branch. After the plant has fruited, the floricanes will begin to die and should be pruned out. During late winter, thin the primocanes so that each plant has three to four canes. Trailing blackberry plants are not topped off in the summer. A 10-20-20 fertilizer should be applied, following the manufacturer’s directions, in early spring when the plants begin to grow. Control the growth of weeds in the planting bed by using a hand cultivator to remove the weeds, going only an inch or two deep into the soil so that you do not damage the roots of the plant. Once weeds are removed, apply 3 to 4 inches of mulch to the planting bed to keep the weeds down. Blackberry plants need 1 inch of water per week during the growing season. If extremely hot and windy conditions are present, the plants will need additional water.